Identity Theft is a buzz word in today’s World with endless mailings and adverts telling you to shred sensitive information that you don’t need (remembering to keep documents required by the tax man) and to take out an ID Theft insurance policy. Doing these, they lead you to believe, will protect you from ID Theft and let you lead a happy scam-free life. However what they don’t tell you is that not all shredders will keep your information secure. When purchasing a shredder you need to choose between a “Strip” or “Cross” cut model. Strip Cut (or Ribbon Cut) models shred your documents into long strips of a certain width (depending on the model). If someone had the time and patience they could piece together your document and read the contents. Cross Cut (or Confetti/Particle/Crypto Cut) models shred your documents both length and widthways leaving you with small particles that look like confetti. Depending on the security level of the machine you could end up with between 300 and 1500 tiny pieces of confetti from each piece of paper that you shred. This makes the final information much harder to piece together for a potential criminal. Can you imagine trying to join together pieces of confetti only a few millimetres in width and length to recreate a document, particularly if that document has been shredded along with others? 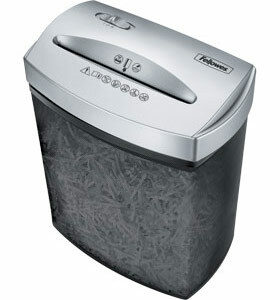 Any shredder owners out there will tell you how annoying it is to constantly empty the bin of your shredder. Fortunately Cross Cut shredders will cause the shredded waste to compact into the waste bin more than Strip Cut models meaning that the bin has to be emptied less frequently. This all seems to mean that Cross Cut shredders are the best thing since sliced bread, however, as with everything; they do have some disadvantages as well. The first of these (and probably the most important) is that due to higher manufacturing costs, these machines are usually more expensive than the equivalent strip cut models and in some cases can be over double the price. Another drawback is that the higher the security level of the machine (and therefore the more shredded pieces you get from each piece of paper), the fewer sheets can be shredded at one time. An office level Strip Cut machine may be able to handle 30 sheets at once, but an equivalent Cross Cut model may only be able to handle half as many, meaning more time spent standing at the shredder and less time doing something constructive! Unfortunately the downsides don’t end there. Due to the special nature of their cutting blades, Cross Cut shredders need to be oiled with special lubrication oil on a regular basis to prevent the machine from jamming or shredding even fewer sheets per pass. A busy office would find it necessary to oil at the start of every day, although occasional home users can get away with only doing so once every month. The final downside can be found out by trying to empty a Cross Cut shredder into an outside bin whilst it’s windy outside. Having done this myself I can confirm that the result is a disaster! Waste sacks can also be purchased but this will further increase the cost. Fortunately there is help with these costs as UK users can visit ShreddingMachines.co.uk where you will find various special offers that give you Free Shredder Oil and Free Waste Sacks (on certain models) so that the cost of switching to a Cross Cut shredder is reduced. They have some of the lowest prices in the UK around and a unique Shredder Wizard will help narrow down the machine that would meet your individual needs. Non-uk users looking to buy a shredder could check out the wizard to choose your model (as most models are available across the world) then do some research in your home country to find the best price. The BBB sends out tips for consumers, and here is their June addition. Love is in the air as many couples prepare for their long-awaited wedding day this summer. When preparing for the big day, the Better Business Bureau of Minnesota and North Dakota (BBB) advises people to proceed with caution when it comes to buying a wedding dress online, choosing a photographer and selecting a wedding planner. Doing so will help you ensure your wedding goes off without a hitch. Asking for referrals and doing a little research can make a big difference in helping your special day go smoothly. Last year alone, the BBB received more than 970 complaints against wedding-related businesses. Services like wedding planners, bridal shops, car or limousine rentals, DJs, wedding photographers, florists, and jewelers all made the list. Many of the common complaints were centered on the company’s unwillingness to honor cancellation and refund policies after a deposit had been paid. From choosing a florist to picking out the perfect wedding gown, more and more couples are opting for online retailers. While most venues have the brides’ best interest at heart, it’s important to recognize the danger signs before shelling out hard-earned cash to unreliable businesses. Research all online vendors. When choosing to go with an online retailer for your wedding services or products, start with a trusted site rather than shopping with a search engine. Search results can often lead you to unscrupulous websites or phishing scams. Also, look for the BBB seal and other widely-recognized “trustmarks” on retail websites. Click on the seals to confirm they’re valid. Confirm that your online purchase is secure by looking for the “s” after “http” in the URL or the lock symbol in the lower right-hand corner of the screen. Be sure to check the company out with the BBB at www.bbb.org before doing business with them. Review all terms and conditions. Whether you’re dealing with an online firm or a brick and mortar store, review the terms and conditions of the contract carefully. What are the company’s refund and exchange policies? What is their cancellation policy? What happens if the company can’t hold up their end of the bargain? Who will perform the service on your special day? Be sure you understand your rights as a consumer before doing business with the company. Keep documentation of your order. For online orders, save a copy of the confirmation page or e-mails confirming the order until you receive the item or service and are satisfied. If you’re dealing with a company representative in-person, be sure to get all details in writing, including specific dates, products, prices, cancellation and deposit policies and signatures from both parties. Pay with a credit card.Credit cards offer consumers the added protection of disputing any charge over $50 within 60 days of the purchase. Most established businesses accept major credit cards, so use them whenever possible, including payment for deposits Shoppers also have dispute rights if there are unauthorized charges on the card, and many card issuers have “zero liability” policies if someone steals your card number and uses it. Never wire money.Consider purchasing wedding insurance. Wedding insurance can cover a range of prospective problems including vendor no-shows, cancellations, inclement weather, military deployment, medical emergencies, travel delays and more. Many policies start at $200 and can potentially save you thousands of dollars. For more consumer tips you can trust, visit www.bbb.org/us/bbb-news. I put out the request for people to take a survey the other day, and it seems like there was a “glitch” in the system that would not allow some people to complete the survey. I spoke with the person in charge of the survey and it has been fixed. The survey can be accessed here. A post-graduate researcher has asked us to help them with a survey they are doing. I have personally taken this survey and feel it is safe for all of you to take, otherwise I would not even ASK for your help. It does NOT ask for any personal information at all, just some questions on your feelings and thoughts on different real life situations. Thank you for your help! Please spread the word to other scam fighting websites that you know.